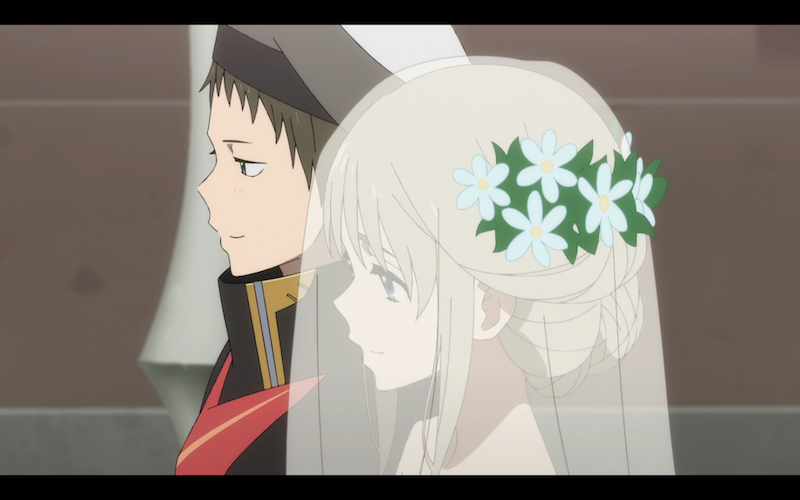 The episode opens with Kokoro and Mitsuru sharing the morning together following the consummation of their relationship. They notice the sakura trees are in bloom, and the two reflect on their beauty. Ichigo is notified that the squad will be leaving their home of the last month very soon, and so in order to say goodbye to their makeshift dwelling and the memories they had formed there, Hiro proposes that they host a wedding for Kokoro and Mitsuru. The rest of the gang loves the idea, even spurned partner Futoshi, who volunteers to be their Priest and marry them off. While the squad begins preparations for the ceremony, Ikuno is hiding away in her room. Ichigo goes to check in on her, since a number of the team had gotten sick recently. During their conversation, Ikuno confesses her feelings for Ichigo, expressing her gratitude for naming her all those years ago, and explaining that she gets jealous and angry with the boys who get to be close to her just because they’re boys. Preparations continue as Zero Two and the others gather materials for Kokoro’s wedding dress: white bath-curtains! All in all, the haphazard ceremony begins to shape up into quite the event for our young squad, with painted scenery and everything. The next morning, Zero Two reflects on her own promise to Hiro to marry him all of those years ago. Walking amidst the cherry blossoms, Hiro acknowledges that promise, and the two look forward to a brighter future together – eager to watch Mitsuru and Kokoro pledge their love to one another. Inside of the house, Mitsuru waits anxiously for Kokoro to come downstairs, overwhelmed by his bride as the two step out to be greeted by their dear friends. Unfortunately, the happiness is not meant to last. Just as they’re about to seal the deal with a kiss, Alpha and the Nines appear with an armed troop in order to arrest Kokoro and Mitsuru and send them off to “re-indoctrination”. Zero Two attempts to fend off the Nines, but they all display a similar level of speed and strength, and so she is quickly overcome. The newlyweds are dragged off, screaming for one another, as the rest of the squad looks on helplessly. The mood sours as they board their shuttle the next day and are sent off to a centralized location where all of the children are being gathered. Identifying “shells” as “bodies”, it appears that Papa is taking an existential approach here, and therefore the goal he and the others are pursuing becomes even more intriguing. On another front, Hachi goes to visit Nana in captivity. Her confinement is likely due to her relapse into puberty, and the audacity of possessing emotions as an adult. We get a brief glimpse into her backstory, since Hachi used to be in the same squad as her. Her former partner was killed in combat, and when she freaked out, she was taken away and indoctrinated. Kokoro and Mitsuru’s recent romance may have stirred some of those memories from their slumber. Weeks pass, and the squad worries about Kokoro and Mitsuru. Finally, Ichigo receives an update and they go to welcome the pair back. To their horror, it appears as though their memories have been altered, much like Hiro and Zero Two’s memories were changed before. They’re still wearing the rings they exchanged, but they don’t recognize each other and think they’ve been assigned to a new squad. Hiro recognizes what’s happening, as does Zero Two, and the flames of rebellion stir within Hiro’s heart once again. The episode concludes with Kokoro reflecting on the mysterious ring on her finger, and recognizing a falling sakura blossom outside. What a bittersweet episode this was. I will be the first to admit I’m still feeling some whiplash over Mitsuru’s sudden transformation from “Grade-A Jerk” to “Perfectly Respectable Guy” in about 2 episodes flat, but that’s not to say he doesn’t deserve happiness once he’s found it. As a Squad that often engages in experimentation, whether they realize it or not, The Wedding was a particularly heartfelt expression of excitement and happiness for their squad-mates. Everyone, even Ikuno (we’ll talk more about her next), played their part in helping to usher the happy couple into the next chapter of their relationship. Although it wasn’t meant to be, the exercise served as another capstone of their camaraderie, and an apt illustration of how far they’ve come since the early episodes. Of particular interest this episode was Ikuno’s profession of love for Ichigo. This caught a lot of people’s attention when the preview aired, but the full scene wasn’t all that scandalous. Ichigo takes this moment to reflect and appreciate the complex emotions and motivations of everyone in the squad. She admits that they’re all flawed creatures, and that the experiences they share are helping to shape them into the people they will eventually become. I feel like this is directly in line with my general thoughts last week on how Squad 13 is representative of a more real and emotional side of humanity, while Papa and APE represent a more sterile and distant take on what it means to evolve beyond our human needs. Following the military raid on the wedding, the latter part of the episode does feel a bit sluggish as the team waits around for Kokoro and Mitsuru’s return. I don’t know what it is about Papa & Company, but I’m always annoyed by their little pow-wow sessions. I feel as though they serve little to the grand plot, and would almost prefer that we hadn’t seen them at all leading up to this point. At this point in the series I’m not sure there will be any redeeming elements for that aspect of the show. The glimpse into Nana’s background was helpful, if not a bit predictable. Hachi’s interactions with her also make me wonder if they’ll eventually join the kids in their inevitable rebellion in order to serve as noble sacrifices for the greater cause. Time will tell, I suppose. The final lines of the episode certainly suggest that Hiro’s had enough of APE’s shenanigans. At this point, that feeling of love in the air has been replaced with rebellion. I’m excited to see this new arc kick-off, and am interested to see where the chips land as the new conflict shakes out. Until next time, you can catch Darling in the FRANXX on Crunchyroll every Saturday morning! My latest review is here!